Our only poll this week is on last night's UFC show, so you can leave a thumbs up, thumbs down or thumbs in the middle along with a best and worst fight to dave@wrestlingobserver.com. We're also looking for reports on last night's ROH show in Pittsburgh and tonight's show in Columbus, OH to newstips@wrestlingobserver.com. Raw takes place Monday in Montreal at the Bell Centre with the first day of the "Superstar Shakeup." Smackdown and 205 Live also take place in Montreal with more of the "Superstar Shakeup." Garrett Gonzalez and I have two weekend shows up on the site covering the latest pro wrestling news as well as coverage of last night's UFC show. UFC 236 ended up with one million Google searches. That's well above what one would have expected for the show, but I'm guessing a key thing is people searching for how the hell to watch it would inflate that number. The NBA playoffs had two million. Tiger Woods over the weekend had ten million. UFC was still second for yesterday. 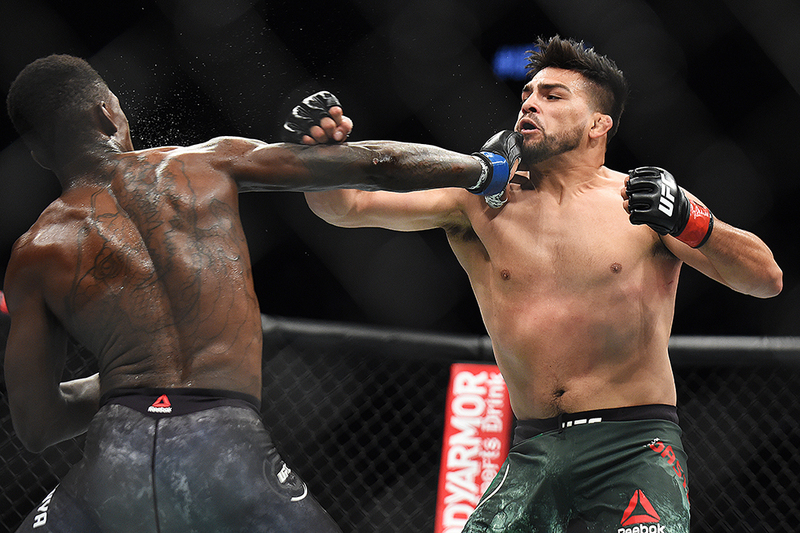 Dana White last night talked about the idea of booking a stadium in Australia for the Israel Adesanya vs. Robert Whittaker middleweight title fight. White also announced there would be changes in how the entire business is done that will be announced in the next few months. I don't know if this is it but one idea has been daily live fights from the arena they are building in Las Vegas, and perhaps multiple shows daily. The second episode of The Dark Side of the Ring series will be on the Montreal screw job. It airs Wednesday night on Viceland. WWE has another World's Collide special on the WWE Network tonight at 8 p.m.
Adam Cole and Kassius Ohno will be working for Evolve on 5/10 in Livonia, MI and 5/11 in Indianapolis. 559 Fights on 4/19 in Visalia, CA at the Convention Center with a main event of Kat Solorzano v.s Meggan Tamondong for the 115 pound amateur championship. There was no update but Pac landed badly on his neck in a match yesterday in Aberdeen, Scotland. Stardom from today in Tokyo for the draft show: Rina b Hina, Tam Nakano won three-way over Hana Kimura and Rebel Kel, Natsuko Tora & Leo Onozaki & Saya Iida b Hazuki & Natsu Sumire & Andras Miyagi, Arira Hoshiki & Saki Kashima & Starlight Kid b Konami & Bea Priestley & AZM, Hana Kimura won four-way elimination match over Kagetsu, Momo Watanabe and Mayu Iwatani. Impact on Twitch from last night in Owesnboro, KY: Trey Miguel & Zachary Wentz b Cameron & Carson Murphy, Cali Young b Madison Rayne, Ace Austin won over Ryan Dookie, Chad Stallings & ?, Brian Cage b Mad Man Fulton, Moose b Daniel Eads, Sami Callihan & Jake & Dave Crist b Chase Stevens & Shayne & Shaun Maddox, Johnny Impact b Chris Michaels. John E. Bravo was in Impact's corner. Next Twitch show is 5/11. AAW on Friday night in Merrionette Park, IL before 605 fans: Ace Romero won over Clayton Gainz, Jimmy Jacobs, Paco and 1 Called Manders David Starr b Adam Brooks, Kimber Lee won three-way over Kris Statlander and Shazza McKenzie, AR Fox & Myron Reed b Dezmond Xavier & Matt Cross, Mance Warner b Jackson, LAX b Penta 0M & Gringo Loco to retain the AAW tag titles, Jacob Fatu b Larry D, Darby Allin b Sammy Guevara, MJF b DJZ to win the Heritage title, Jesicka Havok & Mat Fitchett & Davey Vega b Curt Stallion & Jake Something & Eddie Kingston in a street fight. Next show is 5/11 in Chicago at the Logan Square Auditorium. Pro Wrestling Eve from yesterday in London: Laura DiMatteo won four-way over Roxxy, Charli Evans and Gisele Shaw, Erin Angel b Chakara, Mercedes Martinez b Night Shade, Rebel Kinney b Mercedes Blaze, Su Yung b Session Moth Martina, Emi Sakura b Jamie Hayter. Next show is 4/26 and is Kris Wolf's retirement show which will air live on Eve on Demand. Mercedes Martinez, Jamie Hayter and Session Moth Martina were unable to get out of London for today's Fierce Females show in Glasgow. The promotion has already announced offering refunds to anyone unhappy about that. Sendai Girls from yesterday in Osaka: Mika Iwata b Mikoto Shindo, Manami won three-way over Sakura Hirota and Kaoru, Dash Chisako & Hiroyo Matsumoto b Alex Lee & Hikaru Shida, Meiko Satomura b Millie McKenzie, Jordynne Grace & Saree b Chihiro Hashimoto & Killer Kelly. Combat Zone Wrestling Best of the Best tournament from last night in Voorhees, NJ: Anthony Greene won over B-Boy, Anthony Gagnone and Mance Warner to win the CZW title, David Starr won over Jimmy Rave, Darius Lockhart and Joey Lynch, Jordan Oliver won over Sammy Guevara, Myron Reed and Matt Travis, John Silver won over Kris Statlander, Gary Jay and Fred Yehi, David Starr b Anthony Greene to win CZW title, John Silver b Jordan Oliver, Leyla Hirsch b Shazza McKenzie, Ellis Taylor & Charlie Tiger b Punk's Pro IFHY, John Silver b David Starr to win Best of the Best tournament and CZW title. House of Glory wrestlers then beat up DJ Hyde, David Starr and John Silver as well as destroy the trphy and teal the title belt. Next show is 5/11 from he Colossal Sports Academy in Voorhees, NJ with Masada vs. Brandon Kirk. A documentary on the life of Adrian Street called "You May Be Pretty But I Am Beautiful" will have its world premiere on 5/16 in Wales at the Market Hall Cinema. There will be an 80s wrestling convention on 4/27 in Freehold, NJ at iPlay America from 10 a.m. to 5 p.m. with Jake Roberts, Ricky Steamboat, Ken Patera, Bruce Prichard, Wendi Richter, Nasty Boys, Greg Valentine, Bob Orton Jr., Slick, Warlord, Barbarian, Tony Atlas, Rocky Johnson, Lanny Poffo, Koko B. Ware Afa, Sika, Paul Roma, Jim Powers, Ron Garvin, Barry Windham, Gary Michael Cappetta and Barry Horowitz. CWE on 4/18 in Regina, Saskatchewan at The Owl with Psicosis vs. Shaun Moore vs. Jimmy Jacobs vs. Jeff Tyler vs. Michael Elgin vs. Mike McSugar. Vinny Marseglia and T.K. O'Ryan are on the show.